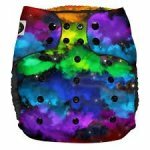 The Imagine One-Size Bamboo All-in-One Cloth Diaper is lined with 1 layer of a buttery soft, yet incredibly absorbent 70% bamboo, 30% cotton fabric with a complimenting waterproof outer. 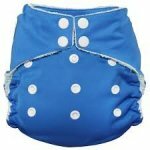 An additional 4-layer bamboo soaker pad snaps into the back of the diaper for customizable absorbency, but still allows for a quicker dry time. The gentle leg casings prevent leaks while keeping your baby comfortable.Imagine Bamboo diapers now have even SOFTER bamboo that will STAY SOFT throughout washes. 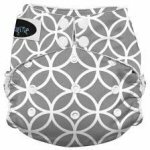 We also have BIGGER better sizing for our one size Bamboo AIO and Bamboo Fitted diapers to accommodate little ones of all sizes. 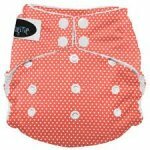 A few other minor changes have been made to make for BETTER diapers. 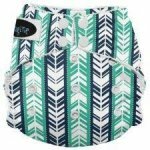 The Imagine One-Size Bamboo All-in-One Cloth Diaper is available in 5 beautiful colors and comes in either snap or hook & loop closure. The snap closure features high quality, durable snaps and the hook & loop closure feature large folding tabs for easy laundering. All-in-One Cloth Diapers are the most like disposable diapers except that they are washable! The name "all-in-one" simply means everything you need is in one piece! Simply put the diaper on your baby and change the entire diaper when it's wet or soiled. There are no pockets to stuff and no folding or pinning! 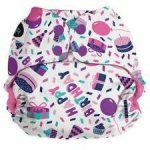 This one-size diaper is adjustable to fit most babies approximately 8-35 pounds. 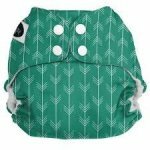 To prep your Imagine One-Size Bamboo All-in-One Cloth Diaper for its first use, be sure to wash and dry it at least 3 times, using detergent with each wash.